In our opinion, the true prophets of today are those who see the evil in this world and speak out and/or write against it in the hope of turning the people away from such evil activities and back to the created and heavenly intent of God. 1) Are you seeing this trend as well? If so, please give examples (recent books, articles, courses offered, etc.) because we want to include a reading list with the article. 2) What do you make of this trend? 3) What do you think is the way forward toward conceptualizing (or reconceptualizing) animal rights/vegetarian ideas and goals within your own religious perspectives? We believe that the increase in religious animal rights and vegetarian publications has a parallel relationship to the increase in intensive animal agriculture (factory farming) and the increased media (including the Internet) reporting of it and of other animal abuses. There is also a parallel relationship to the writings of the Biblical prophets concerning the people's turning away from God and their hardness of heart. The prophets seem to have written, in part, because of a deep inner sorrow and righteous indignation about what they saw going on around them and the religious communities' total indifference to it, and even their participation in it. We believe that this deep inner sorrow is the motivating factor in our modern religious animal rights and vegetarian writers. These are the modern day prophets. To us, there seems to be two "Biblical" perspectives of these writings: those who believe the Bible is inaccurate and has been deliberately distorted, such as Keith Akers, and those who believe that the problem lies not with the Bible, but with the way it's interpreted and put into practice such as J. R. Hyland, Andrew Linzey, and Richard Schwartz. We put ourselves in the latter group. This deep inner sorrow over the pain and suffering we see in the world and the total indifference of "God's people" to recognize it as the evil it is, and their reluctance to cease from their evil ways, makes us want to run and hide in a cave like Elijah, or to weep before the people as did Jeremiah and the other prophets. Today, in our weeping and anger we write books and articles, as well as speak before the people. Part of the evil that we see is the "lowering" of the afflicted ones below our "superior" human status: "animals don't feel pain", "we have dominion and are to rule over the animals", "animals don't have souls and spirits", "animals are here for our use and pleasure", "animals don't have rights; only people have rights", "God commanded us to eat meat", etc. Such obvious lies, make it easier for those who believe them to abuse these "lower beings". The same type of justification was used in Nazi Germany and with slavery. If I recall correctly, this is what happened to a young Jim Mason. Carol Adams and J. R. Hyland, for example, have written about the parallel between the oppression of women and of animals. And we are hearing more and more about the parallels between the Holocaust and what is happening today on our factory farms and in our slaughterhouses. So, we continue to write and work to counter these evils in the hope that some people will wake up and realize the evil we, as a society, have been doing, and repent of our ways. 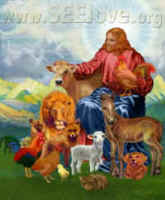 We want people to see the perfection of God and His intent for the whole of creation: a state of being where there will be no pain or suffering or death, and where we and the other animals, our fellow living souls (Hebrew: neh-fesh khah-yaw), will live together in peace forever and ever.